Just looking at this is exhausting. It is why I only recently finished the main story of POE1 despite being a kickstarter backer. I can't deal with it. I don't know if it's normal or if it's related to my being on the autism spectrum, which I didn't know about until my son was diagnosed. Some of what I've learned concerns difficulty with processing information and dealing with too many tasks or too many choices. So part of me thinks it might be just me, but another part of me looks at this and says it's ridiculous; that of course it should be better organized. There are even White March quests here that say nothing at all about where they take place. I don't know how Obsidian wants to organize it. I would really appreciate it if companion quests had their own list. Sort by level? By area it was obtained? By area of the next step in the objectives? I don't think the actual game designers need my help. You might have some particular issues as *well*, but it's not just you. That quest journal is a *cluster*****. Wait, is that a picture of your current active quests, or does it also include the entries from completed quests? It would be also great to have a button on Character Creation screen that would open the Cyclopedia (specifically: Status Effects and Mechanics), because there arise many unanswered questions when trying to create a character for the very first time. Only the bottom one, "Servant of Death," is inactive. I don't quite get what is actually bothering you. You're saying it's bad, but it's not evident to me what exactly is bothering you about that screenshot. The order in which the quests are listed? The descriptive text of the quests? I never had a problem with the quest log; I just do all the available side-quests when I get them before proceeding to the next main quest. I don't think I ever had more than 10 active quests at the same time. The journal is as ok as it can get I think. You got your quests/tasks on the left, their phaces/descriptions on the right. What else can be done? The only thing I can think of that could help is to let you custom tag your quests. Like put a number or a color or mark so you can know in what irder you want to solve etc. Now, OP, if I had so many quests gathered in there I would have problems with that too, but this is mostly about you just gathering them and not completing them? Quests dont dissapear or get moved to the journal when you complete them? You will just accumulate a giant page of quests over the course of the game? Meaning, the picture shows 26 active quests and 1 inactive. Why didn't the "inactive" quest go away? Inactive quests don't dissapear, but move to the bottom and are greyed out. It might be more handy to create seperate "completed" tab but I didn't find it to be an issue. I found journal to be just fine, giving me information I need when I need them. Keep in mind some quests don't give you detailed information because they are not supposed to. I think the biggest problem is that you didn't complete quests - I don't remember ever having that many active quests at any given time. The only issue I had that sometimes division between "sidequests" and "tasks" wasn't that big and I would look for a quest in a wrong tab for half a minute. I think the biggest problem is that you didn't complete quests - I don't remember ever having that many active quests at any given time. if I had so many quests gathered in there I would have problems with that too, but this is mostly about you just gathering them and not completing them? That's fair. If I did not allow the list to grow long, it would not be long. I knew that, and for a while I tried to clear it. Sometimes games are played in unexpected ways. I don't think "get a lot of quests" is so far out there that designers can or should ignore it. Quests beget quests. You travel for one and end up in an area with three more. The quest log can snowball quickly unless you do them in the proper order. It ended up this way because it started getting long and I said "there's only one way I'm going to manage this" and went straight down the critical path just to see the ending and avoid being spoiled while reading about POE2. It would be even longer, but I started avoiding talking to NPCs. Maybe organizing by region or island would help for Deadfire? Or maybe ones which currently have active objectives in a certain area? Given that we're going to be travelling in a much larger region with many more places to visit, it would definetly be wise to have the quest journal have more organization options. If quests will take place mostly in contained areas it would work, yes. However, if quests tend to hop from one map to another (like in PoE) it might be more confusing that anything else, at least in a way I approach the game - I tend to follow quest line threads rather than cleaning areas. I think filter option would be nice. Maybe search for quests active in current area etc. That's the basic idea though, to try and apply some filters to them. 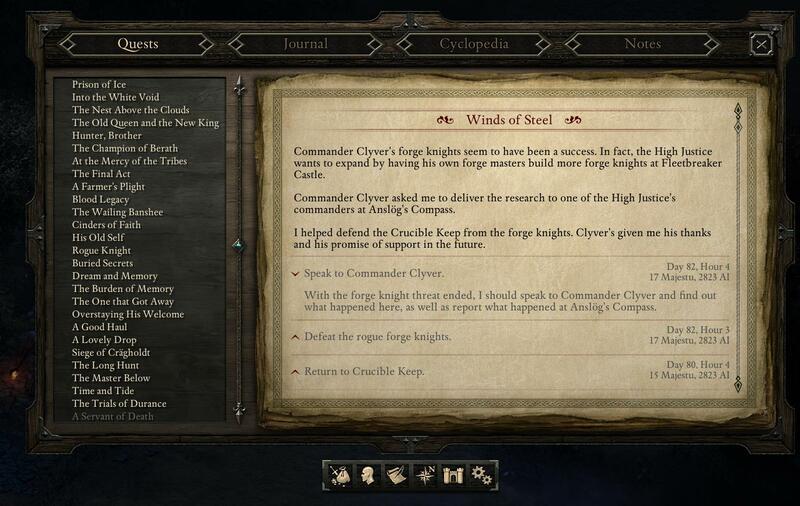 Have you guys seen the journal in DOS2? Compared to it, this is god's gift to RPG community. Organization wise, the D:OS2 quest journal isn't bad, the reason it's bad compared to PoE1 is due to the bugs with quests not closing properly and sometimes due to the way each journal entry was written. Also, in a few cases, it closes too soon, like the Missing prisioners one, it closes when you find the fate of the missing prisioners, but you don't get rewarded until you go back and talk to the warden who you got the quest from. Wow. I've never had that many active quests at once but I agree it could definitely be better. It seems quest are not sorted at all except major/minor/critical. I think even if a quest objective changes location from one place to another it would be helpful to at least see where the quest originated (f.e. Defiance Bay). On thing I remember is how the journal annotations updated in what often seemed an illogical manner. I think it would be great of it took into account a quest's own partial ordering and allowed those sections to be order in the manner which the player tackled things. What's the best example of a journal in a game? Maybe WoW? It's pretty clearly separated and that. and you can hide or unhide whatever you want. For whatever reason, I actually really enjoyed the way the questlog and journal were done in the game Arcanum. IIRC, they were basically sorted in the order you obtained them, like a real handwritten journal would be. Some were done in slightly different colors, and if you screwed the pooch and failed the quest, they would be crossed out in bright red. Having a journal done in this way, combined with the way PoE 1 quests would update as you progress and had a drop down menu, would be ideal to me. The journal in Arcanum also had other tabs for your reputations, rumors you overheard from NPCs, injuries, combat statistics, player-made notes, the works. Also, as I'm looking at my current questlog in PoE, it would be nice (given this system) to have a checkbox or something to hide/minimize completed quests/tasks and make viewing all the current quests a lot easier. The journal seemed fine to me. Sure had some problems, but I have never seen a in-game journal that didn't. As with anything in life, the perfect game journal is a pipe-dream we should strive toward but realise we may never achieve. I have seen much worst, I have seen better. Personally, I do like (current) quest markers. I have a limited time to play games, and remembering a dozen quests lines over weeks is just not feasible. I do get that some people hate it 'cause immersion and to be fair, a walk through will have a map with a marker on it. Allowing quests to be sortable by area, level, "treasure hunt", or main/sub-plot would be a good addition. It would be nice if there were links to names as well: Who was Fred again?… But that will get really complex really fast. That wouldn’t be too much to ask as they are implementing annotation system from Tyranny. Seeing a very short character summary by hovering over the name, is a desirable addition with so many overarching quests and foreign names to remember. Ehh... it's not really about immersion. That's more of a side effect -- immersion being broken I mean. The main problem with default quest markers, at least (it's fine if there's some "I don't have time for this" mode/option you can turn on if you want everything indicated perfectly for you) is that you have the game presenting you with a challenge of "Find such-and-such," and it's pointing right at it, so you're not finding anything. The game world is telling you that your characters don't know something, yet the person controlling them gets to know it, straight from the game itself. Now, if your character speaks to someone and they say "Oh yeah, you're looking for Recluse Reynard? He's up on the mountain. Here... I'll draw you a map and/or elaborately explain exactly how to get to him, so you'll know where you're going," THEN I'd say "Okay, there's no reason my character shouldn't know where to go now." Even then, I'd kind of rather the character say "This is the tree I'm supposed to take a right at," etc. instead of just having a marker off in the nothingness that my character hasn't yet seen. Partially for immersion, sure. At this point, it doesn't much matter, objectively, as your character knows how to reach their destination. I just think it might be more interesting if they intuitively followed their directions rather than just knowing the exact GPS coordinates of the destination. Toward that end, it'd be even more interesting if people would actually lie to you, or provide crappy descriptions, in some instances, and the markers that the game gave you (because of the knowledge your character has) are actually incorrect. Sometimes, I mean. Not like "every single person in the game lies to me!" That's exactly what I was thinking. The annotation hyperlink system creates the opportunity for more advanced quest tracking just by it's very nature. That system may end up a golden opportunity--a style-defining convention that has many unforeseen consequences in game design and genre convention.